It trips off the tongue, with a sonic echo of “meadowlark” and allusion to song and reverb. Coincidentally, echo seems to be a theme this week, with shows by Echo Ravine, A Townsmen Echo, and previous Square Pig honoree The Echo Echo Echoes. These four should get together sometime! Item for sale in the drugstore or the popular high school clique? You decide. This could be an alibi: “It wasn't me. I don't even wear makeup.” But I like it better as an expression of wholehearted, all-or-nothing-at-all engagement. This was the first name to grab me this week, and it was their debut show! I'm picturing a monstrous creature with an eye at the end of each of its three horns. This doesn't really have anything to do with band names, except that Pankhearst is like a record label, but for books. (They've also claimed to be a garage band, but I'm waiting for proof.) 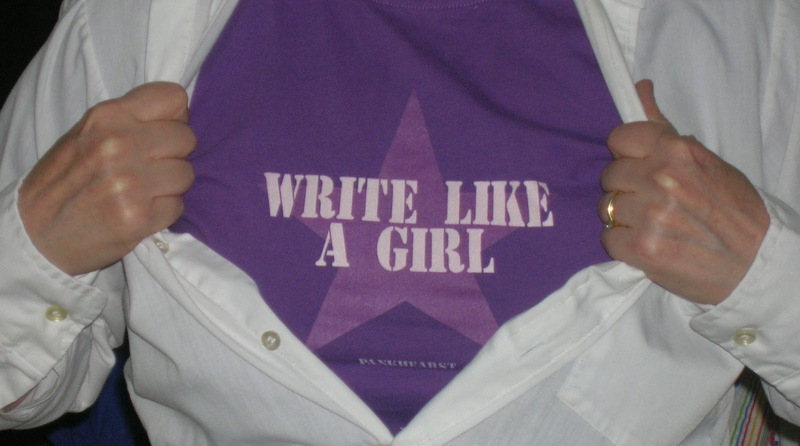 Anyway, in addition to lots of great fiction, they now have this cool "Write Like a Girl" t-shirt for sale. If you get one soon, you can enter a photo contest and maybe win fabulous prizes! This implies that fidelity is on a scale, with "only cheated a little bit" and "almost faithful" on the line from unfaithful to faithful. Or perhaps this is the congregation that makes it as far as the church door but not quite all the way inside. What kind of science fiction writer would I be if I let this one slip past? It's reassuring to know that the future will include such funky grooves. Personally, I'm a time-traveler from the past, traveling by record at 33 1/3 rpm. This method is slow and turns your hair gray. This is such a cheery announcement of impending doom. This one taps into the creepy atmosphere of classic horror/suspense film. It could also be an Agatha Christie title, with the violence already in the past. It showed up in the paper as two words, but I like it even better run together, all lowercase. Unusual enough to be some surprise without overwhelming the senses. It creeps up. I don't know about anyone else, but I enjoyed yesterday's all-day thunderstorm (sorry, people at Hempfest). Rain in August should be loud and dramatic. I'll bet the couple getting married last night at the church where I work were glad they'd planned an indoor ceremony. If the cooler weather encourages you to try an indoor activity, maybe go hear a band or four! As it happens, almost all my picks this week played last night, but there are plenty of others out there who would love you to join their audience. I love this mix of aggression and caution. We think of eggshells as fragile, but because of their shape and composition, they're actually incredibly strong for something so thin. A good metaphor for a well-put-together rock & roll song -- it holds together even when it sounds like it's going to fall apart. 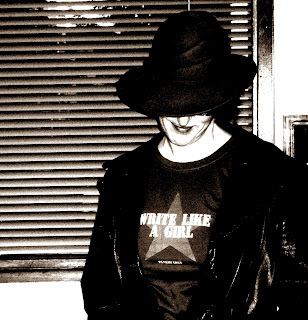 I like the idea of a special school dedicated to underdogs, losers, and ne'er-do-wells who need one more chance to find their true path (and maybe start killer bands while they're at it). It's an idea that's just crazy enough to work. Continuing with the back-to-school theme, this one appeals to me as a fan of the old Pogo comic strip. In 1950, when some Southern schools closed rather than accept racial integration, Walt Kelly drew a series of strips in which some swamp critters opened a "speakeasy school" so the chilluns could still quench their thirst for learning. I wonder, would kids be more eager to go to school if they had to be sneaky about it? Wrapping up the theme, this is a hot topic around Square Pig HQ. Considering the ages of the junior SPs, I'm feeling lucky it took this long, but the eldest of them is about to borrow a bit of money for school. If all goes well, it won't prove too burdensome, which can't be said of many in his generation. They should all be issued a banjo to cheer them up. One of my most enduring memories from summer camp: a girl in my cabin, determined to win the big splash contest, performed an epic intentional belly flop that bruised several ribs but won the prize. Bragging rights have their price. The dark side of Schoolhouse Rock. A perfect punk-rock name: unapologetic ickiness and blood, in one of the classic band-name formats. The formality of the phrasing gives a sense of sitting around a table, planning a secret mission with the knowledge that one of the group plans to eat the others -- but you don't know which one. I'm always happy to see a band name that consists of a noun with no article, especially when it's an animal, and even more especially when it's a small, quiet invertebrate. The quieter the critter, the louder the music. 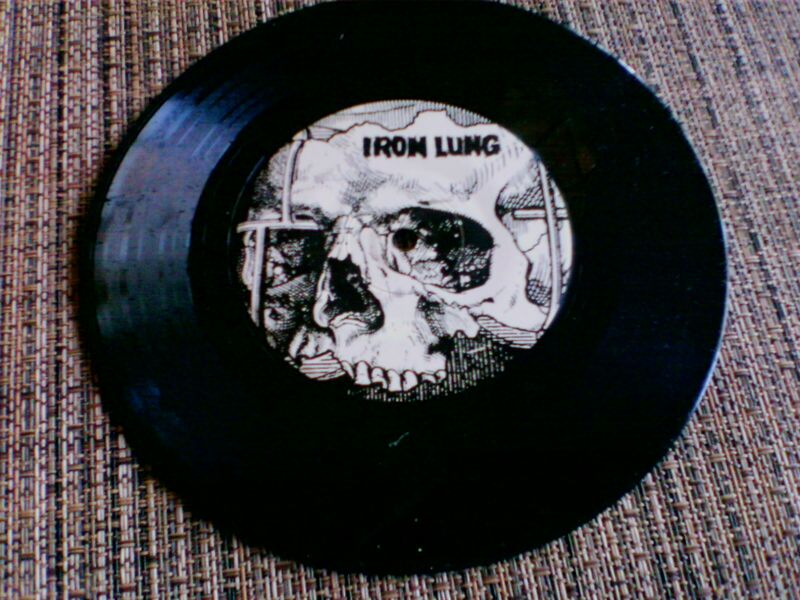 Walking along Lake City Way yesterday, I found a discarded 7" lying by the side of road. I was almost home and it was so hot out, I almost didn't pick it up. 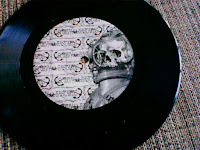 But how often do you find an unbroken (not undamaged) vinyl record just lying there? I picked it up. 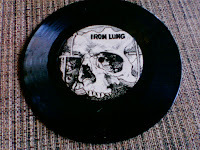 It still plays well enough for us to determine that both bands -- Iron Lung and Scurvy Bastards -- have names perfectly suited to their genres. For that, both receive honorable mention in this week's blog. The peaceful chorus around a remote campsite? The response to a failed joke? I suspect something much louder than either. I don't think I ever noticed how similar these two words are until I saw them in proximity. I kind of feel sorry for the poor guy who has to be a footstool. And by the way, this is a power trio of cello, vibraphone and drumset! Oh, hell yeah! Part of the appeal of this name, short as it is, is that I'm not sure how to pronounce it. The apostrophe implies a French accent. 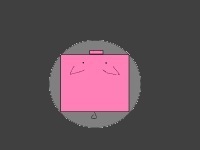 The logo on his Tumblr indicates that it has more to do with owls than jowls. You know, like a seahorse but small and cute. All the little mermaids want one. This turns the idiom around so instead of giving just the high points, the tale teller keeps adding details and characters, subplots and characters, until the short story is a novel, a trilogy, a series. As a writer who has just finished growing a novel out of three short stories, I stand and salute.